Figuring it was the last day of the Idaho waterfowl season, I played hooky from work (we are super slow at work right now anyway) and took Rowdy out. Almost all of the honkers and mallards wanted to be out in the big open water in the middle of the lake, but we did get a single to come take a look at the decoys. He got a little too close and became the only bird of the day for Rowdy and I. Closing weekend of upland birds is this weekend, but it's supposed to rain pretty hard in the areas I normally hunt, so we will see. Last edited by RowdyGSP on Sat Jan 27, 2018 6:34 pm, edited 1 time in total. Nice work. Way to end it. Work during the closing of waterfowl is for suckers! Gotta do what ya gotta do. The sacrifice justifies the results. Way to make the most of your opportunity. I played hooky today too! I started when getting a Canada Goose was a rare and treasured Trophy Bird. I am fortunate that the feeling has stuck with me. Any day spent with your dog and bagging a Honker is a great day. I had the first Maxima species Canada I bagged mounted. It was taken in a zone centered around a state/federal Waterfowl area where they had been re-introduced and the numbers built up such that a season had been opened. You had to buy a tag and place it on the goose's leg when you took one, and were allowed only one tag a season. I scouted and then knocked on some doors and got permission to hunt on a place the geese flew over regularly. 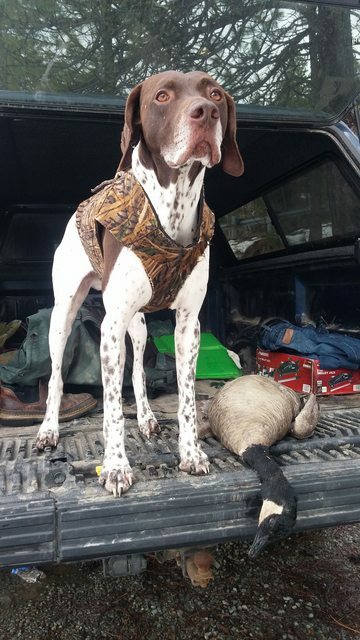 I hide in full camo in a hedgerow and pass shot a 13lb goose and my first GWP Hank retrieved it. Was a big day for both of us. Hope that is the kind of joy this hunt brought to you and Rowdy. It has been a good season and we should be always thankful for that. AverageGuy wrote: I started when getting a Canada Goose was a rare and treasured Trophy Bird. I am fortunate that the feeling has stuck with me. Any day spent with your dog and bagging a Honker is a great day. Yes, I agree. I would rather shoot 1 goose than 3 or 4 ducks. There's just something pretty awesome about watching a big ol honker fall out of the sky while your dog busts ice to go get it.